Ellinikon (or Hellinikon) International Airport was the international airport of Greece (Athen) for sixty years up until 2001, when it was replaced by the new Athens International Airport “Eleftherios Venizelos”. The airport grounds are located 7 kilometres (4.3 mi) south of Athens, and just west of Glyfada. In April 2011 the Olympic Airways Museum opened in the West Terminal. Their display includes three aircraft that had been parked there since the airport’s closure. While the majority of the airport sits in ruin, there were plans to develop the area into either parkland, commercial, or residential areas. With the collapse of the local economy these plans are yet to be realised. The images (and text) below, sourced via Imgur user TBSM, show parts of the terminal facilities in a state of disrepair, while other areas seem as though they’re ready to board passengers. 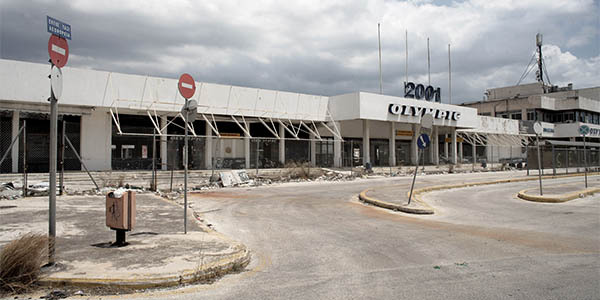 Opened in 1938 and closed in 2001 after a new airport was built for the Olympics, Ellinikon International Airport sits abandoned without any hope for redevelopment since Greece is more broke than.... hummm no one is more broke than Greece! Your typical Cold War's head quarter. Your flight to Paris has been...delayed. Flight A340 for Warsovia will depart in 30 minutes, please prepare your boarding pass. Skýlos is waiting for arrivals...business has been rough lately.